Controversy surrounding the city’s new library project dominated the January 28 City Commission discussions, even though it wasn’t on the agenda. This time around, criticism came from state officials, who aren’t happy with the City’s plans to build its new library and civic center at Martin Luther King Park. The state has even warned that the city could lose future grant money for parks if it doesn’t comply with the rules. None of that is stopping the City from going full speed ahead with the project. Plans are underway to tear down the Rachel Murrah Civic Center this week and take the chainsaw to 60 trees at the park between now and April. The Florida Department of Environmental Protection notified the City Manager in a letter dated March 6, 2018 that the city had failed to follow the rules governing a grant it received in 1994 for improvements to Martin Luther King Park. Commissioner Carolyn Cooper and several citizens pleaded unsuccessfully with commissioners to hit the pause button to resolve the issue. Seen in this context, and taking into account the City’s failure, so far, to come up with a clear plan to bring the Canopy project back in line with the $30 Million budget approved by the voters in 2016, the decision to proceed with such haste gives one pause. This could affect the City’s application for a FRDAP grant for improvements to the wetlands around Howell Branch. A January 16, 2019 letter from FDEP stated, “It has also come to our attention that some or all of the City’s previous land and recreation grants do not have restrictive covenants recorded for the parks funded by our grants.” In addition to MLK Park, the letter contains a list of other FRDAP grants for locations such as Lake Baldwin Park, Mead Garden, Phelps Park and the Howell Branch Preserve, requesting the City to provide copies of the declarations of restrictive covenants for each within 60 days. A FRDAP grant to the City carries with it the requirement to publicly record with Orange County a covenant restricting the park to outdoor recreation, in perpetuity. During public comment, several citizens urged the Commissioners to move cautiously with their demolition plans until the way forward is clearer. “I see a tendency by the City to insulate itself from opposing views and from citizen input,” began Beth Hall. She pointed out that the original Library Task Force had considered multiple sites for the new library, MLK Park among them. “But I don’t see where the FRDAP grant was pointed out or considered by the Task Force,” she said. “Thus a major restriction on the viability of the site was ignored.” Hall pointed out that the City had made no attempt to inform voters of this issue at the time of the bond referendum. Who Knew about the Grant? In a January 30 email responding to a public records request from Beth Hall, City Clerk Cindy Bonham confirmed the City has no records of communications or materials about the MLK Park FRDAP grant being provided to the Library Task Force, to the Commission, to the Planning & Zoning Board, the Library Board, the Library Staff or to the trial court that heard the bond validation suit. When is a Canopy Not a Canopy? Charley Williams displayed the City’s tree demolition legend, which identifies more than 60 trees that will fall victim to the chainsaw this spring. He suggested the City Communications Department might keep citizens abreast of what will transpire in MLK Park. 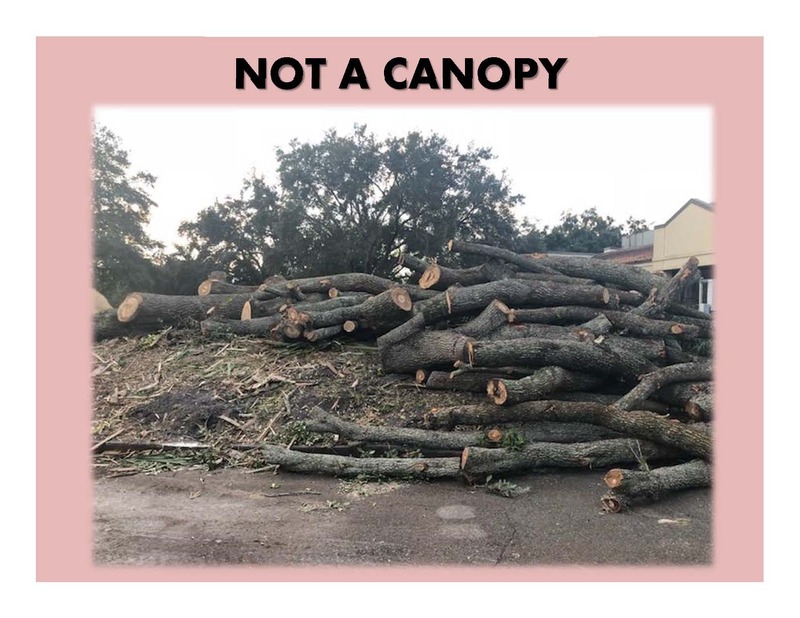 He showed before and after pictures of mature live oaks that were removed January 26 to make way for the Civic Center demolition. Kim Allen enumerated ways in which the Canopy project has changed since it started in 2016. The square footage of the library is significantly reduced. Elements of the buildings, like the porte cochere at the entrance, have either been eliminated or declared ‘alternatives,’ which the City can build only if it raises additional money. The $30 Million budget cannot accommodate many elements that would seem integral to the success of the project. Cooper reiterated her suggestion to put the matter of the grants on the City Manager’s report so that people could see periodic updates of how the City is working through the issue. Cooper’s desire for this kind of transparency was not supported by her fellow Commissioners. Good. Let’s get going on the new library. That neither the commission nor the city manager had any comprehension of EVEN the YEAR in which the grant originated was stunning to me. That they did not even consider the state imposed FRDAP Grant restrictions a factor when they decided where to locate a $30 million + project (with the exception of commissioner Cooper) was surprising to me. The agenda packet that went to P & Z was silent as to the FRDAP grant restrictions as was the packet that went to the commission. However, I raised the issue to both bodies as the conditional use approval was being brought to a vote. I highly doubt that the State of Florida would appreciate that their grant money and the conditions under which that money was accepted meant so very little to our city. Carolyn Cooper was the ONLY commissioner to vote NO on the conditional use approval. It is very easy to see why she was re-elected without opposition. You don’t spend $30 million in citizen taxpayer dollars without crossing all your t’s and dotting every i. It seems likes people who don’t want the library alerted the state about the violation (that hasn’t happened yet) and hasn’t taken into consideration the impervious land they return to the park from the Murrah location and the original library location etc. I’m pretty sure the state of Florida isn’t monitoring grants from 25 years ago and would have never issued the violation warning if not for the eagerness of the anti-library group. I’m not sure why the anti-library crowd insists on continued road blocks instead of solutions. My children use the library on a weekly basis and we are desperate for a state of the art facility. Obstruction tactics cost money but don’t stop the inevitable. If you want things to be better, then do a better job at making it better instead of trying to stop it. It seems to me that people are upset that hundred year old trees that were supposed to be protected are being shopped down. I for one am tired of everything being bulldozed over and clear cut for buildings and neighborhoods. We need to teach our children the value of nature. A tree is a home to so much wildlife and a tree cleans the air we breathe. Those trees are older than all of us. This plan is a disgrace. I was a parks and recreation assistant director in 1994. I wore a plastic helmet when we had the ground breaking of a swamp into a beautiful park. Our department was guided by a grant writer at City Hall. To my knowledge our department only administered the construction not the FRDAP grant itself. Full steam ahead! We can’t develop the property we scooped up along Fairbanks Denning and Orange without this giant taxpayer funded anchor to make it desirable. What ever happened to naming rights for the new library? When the City Commission first attempted to sell the boondoggle to the residents, they insisted that people would be lined up to pay millions of dollars for naming rights. They even debated hypothetically which names should be allowed and which should not. So where are the names? Could it be that nobody wants their name associated with it? Could it be that no one has stepped forward to donate towards the theft of the residents beloved downtown Library? No naming rights sold means NO LIBRARY can be built cause THEY DON’T HAVE ENOUGH MONEY TO BUILD IT! People with millions of dollars to donate didn’t get millions of dollars due to stupidity. Our City Commission geniuses are attempting to sell naming rights at the same time they are getting ready to bulldoze the building a previous City Commission granted naming rights for. Who in their right mind would pay for naming rights to people who renege on grant agreements, who renege on MLK Park statue commitments, and who willy nilly destroy perfectly good already named buildings? Who in their right mind would want to make a naming rights deal with the side of Commissioner Sprinkel or Mayor Leary that we see in today’s The Voice video? Bottom line is Commissioners are caught with their pants down. They have a white elephant project that almost nobody in town wants, and no way to pay for it. So they are resorting to juvenile tactics to distract attention at least until the City Commission election is over. Then they will attempt to drag out the project further hoping for a big donation, or a grant, or another bond referendum election to bail them out. If ever there was a stunning display of government mismanagement I haven’t seen it until these videos and this report. Where was Weldon in all of these attacks on the public by the Mayor and Commissioner Sprinkle? We’ve learned the library relocation is already $10 million over budget – I recall Mr. Weldon’s loud and vitriolic condemnation of former Mayor Strong when he negotiated a $3 million payment to the Carlisle developers to make them go away. Oh, at the meeting Weldon joined in with the Terrible Twos in denial of the facts. The Voice probably didn’t include that video because it wants to be impartial in the upcoming election for his Commision seat. No one should ever expect anything more out of the Troublesome Trio. This is not an “Either/Or” argument. The new Canopy project at MLK Jr Park can be graced with an ACTUAL canopy (after all, the trees were there first). Trees can be saved and kept. You would think this was the original intent of the branding team, to capitalize on the Winter Park tradition of stately oaks on the lakes for which our community has garnered its worldwide reputation: Florida as it should be. To the horror of many, as we are now learning, the Land Design civil team is proposing stripping the site bare, removing up to 60 trees, and replanting juvenile, new growth to make up for the slack. 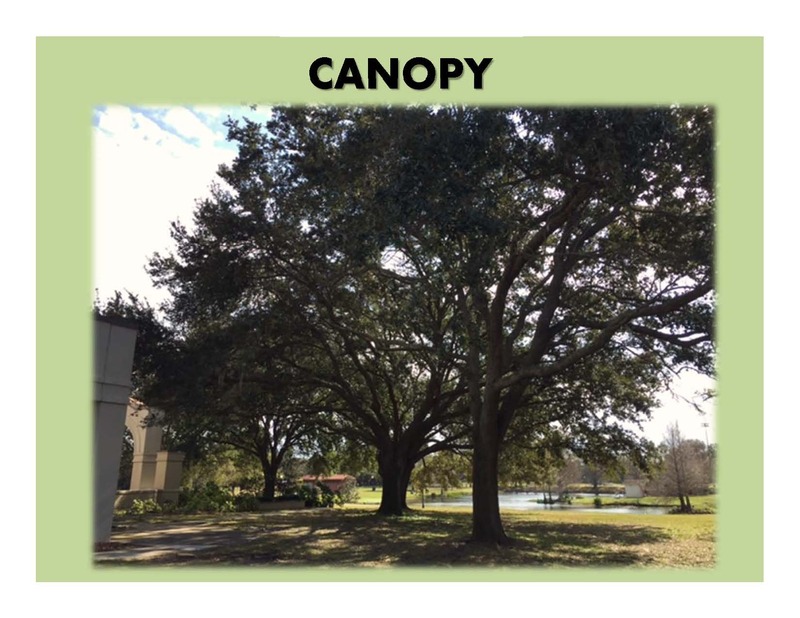 The result is that the only canopy you will experience overhead is if you are 1 ½ foot tall looking up at shrubs, bushes and grasses, newly landscaped. There have been plans to save specimen oaks. And to raise funds to help cover costs. That would be the hero’s path. That would be leadership’s path. Sometimes, as we have all learned, the citizens have to lead. What’s more, in light of the recent findings by FDEP, that the city has been negligent in deed-restricting our parks space, for decades, it’s time to get singularly focused about our commitment to nature. After all, Winter Park without “Park” is just………….Winter. I write to you again to take seriously the comments put forward by Michael Poole and others that Library project has gotten complete out of control. I also heartily endorse the call by Commissioner Cooper to issue a Stop Order on the project. As it stands the project no longer resembles what was represented in the Library Task Force Final Report. In that report, there were pages upon pages devoted to the need for more space for the Library to accomplish its mission. It was stated in the report that 60,000 square feet would be necessary to achieve all the programmatic goals, but this was reduced, by “efficiencies” to a recommended 50,000 square feet. As I understand, the current estimate is for only 36,176 square feet. That is only, approximately, 4,000 square feet more than the current size of the Library, 32,000 square feet. Clearly, if the primary motivation to build a new library was to obtain more space than the mere addition of 4,000 square feet is completely inadequate to accomplish the goals and objectives for the new library. As such, I urge you to STOP the project NOW. Those who voted against the Library project have not been happy with the project from the beginning. I can only assume that supporters of the project must be dismayed (at best) that the project can no longer deliver on the promises made to them. A redirection is in order. Cut our losses, cut loose the “signature architect.” Revisit the possibilities of utilizing the current Library property or building on the current footprint of the Murrah Center or another suitable location. Engage an architect who will take seriously the need to complete the project on time and on budget, AS WELL AS design a structure that will be more compatible with the overall character of Winter Park and reflect the historic architecture that has made Winter Park the gem that it is. Mayor Leary, in particular, you have the ability to redeem this project from turning into Leary’s Folly and transform it into a true Leary’s Legacy. I urge you to take affirmative action now to redirect this project. If they fire the architect, how will Commissioners ever get their family photo with Prince Harry? I suggest Vice Mayor Weldon read Machiavelli’s “The Prince” if he hasn’t already. His “friends” on the Commission could have chosen any time to demolish the Civic Center and chainsaw all the trees. There is certainly no rush to build, given they haven’t finalized a budget. Yet they chose to bring in the heavy equipment now, right in the middle of Vice Mayor Weldon’s re-election campaign. Reason I suggest the book is that sometimes in politics people appear to be friends but are not. And sometimes people appear to be enemies but are secretly allies. Vice Mayor Weldon is a bright guy. He can do the math on how many residents this will tick off, vs. how many love the idea of Winter Park trees and city buildings vanishing and love paying more taxes every year for a new building they might never use. These are not the kind of photos that endear a candidate to voters. At least when Strong paid $3 million to stop the Carlisle, we got in return the West Meadow which is very significant park space. A priceless addition to our Central Park, the crown jewel. Presently, the library equation falls far short. We’re $10 million over budget with a reduction in park space because of the enlarged footprint of the library/event center compared to the Rachel Murrah Center and because of the shortsighted sale of the bowling alley (which could’ve mitigated the large development). Note to the Mayor and the terrible twos – you can’t really count 55 acres of swamp on the edge of obscurity as park land. That’s as dishonest as calling the new project the ‘Canopy’. Truth be told, this project went south the very day the commission naively voted to include the redesign and reconstruction of the Rachel Murrah Civic Center as a byproduct of moving the Library. This was never even suggested, much less promoted, by the original Library Task Force. By adding in this additional layer at the final hour of consideration, the city commission actively doomed this project to exceed budget. And our expectations of a spacious new library of 50,000 sf are whittled down to 34,000 sf/ with NO net gain — not to mention the disappearance of the parking garage, almost from Day One, with no publicly discernible explanation, even though it was one of three keystones in the bond referendum. Now we are finding out that saving our quality trees — our verifiable and true Canopy — will have to be negotiated as an “extra.” That really is the ultimate irony in this exercise. Well, who keeps voting in all these Commissioners and Mayor who play the avoidance and blame games and pay no attention to Commissioner Cooper who keeps calling for transparency? With the budget skyrocketing, donations failing to materialize, and trees falling like flies the Mayor sensed that his second most reliable sycophant (because none can top Sprinkel) was in serious trouble due to this whopper of a fiscal flop threatening a Weldon electoral victory on March 12th. Something HAD TO BE DONE and QUICKLY. But what???! What could save Pete Weldon from paying with his political life for this folly of Leary’s? Aha. Yes. Delaying release of any further budget figures until after March 12th. Though Randy Knight was meeting with the design folks the day after Monday’s commission meeting and would have lots of news on the MONEY part of things, it was made clear that no news on the budget would be released until Weldon could safely be re-elected. The budget buster would kill him if news came out before election day. Nice save, Steve! Nice save! I want to see the photos of them constructing the new library while the site is several feet under water during this hurricane season. Who’s up for re-election next year? That will look good on a campaign postcard from the challenger. Someone needs to file an injunction to halt this travesty before the wrecking ball strikes.. Any lawyers listening? Thank you WPVoice for posting video clips of the January 28 City Commission meeting discussion of parks compliance (or non-compliance) with state greenspace requirements in MLK Jr Park. This is something that merits close attention by all citizens who value a working green ethic and all that flows from that base assumption. The fact that this commission has not pro-actively defended or sought remedy for the slaughter of up to 60 trees tells us something—the intent and level of effort is simply not there. Actions have consequences. Should the current plan go forward, we will not see a mature tree canopy at the NW corner of MLK Jr Park in our lifetimes. I remind you again: this is, above all, a park—and one of the city’s largest and most popular. I encourage you to view these conversations in full once posted in the city’s website. I have to shake my head at all the people here declaring the project to be “overbudget” when Commissioners have yet to vote on a budget, nor has one been presented. I also listened to the Commission meeting and heard Commissioner Cooper say that the EPA seemed very willing to work with the City on this issue, unlike the tone of this article suggests… Or should I say opinion piece. I suppose it has always been clear to me where the writer stands on this topic. The City Manager explains in the full recording that the monies were used for very specific improvements such as the lake and the pathways and NOT to develop or fix anything on the Civic Center site. I don’t see the problem here. But it certainly seems like this group of the same people who hate everything and think everything is a conspiracy caused an issue that wasn’t one to begin with. Now because of their meddling it seems Mead Gardens will also face an issue should they want to improve or expand their facilities, which makes me so angry! Mead Gardens is a wonderful place run by hardworking individuals and now they have been dragged into this. For me, I cannot wait to step foot into the new library, it will be so much better than what we have. Yeah. Make Meade Gardens the next Disney World. All the extra car exhaust fumes will nourish our tree canopy. If the City of Winter Park , the commission and Randy Knight do not wish to abide by the grant terms and conditions which accompany FRDAP grants from the FL Dept of Environmental Protection (FDEP), then the answer is simple. Just stop applying for and utilizing grant money from the state. The letter from Angela Bright /FDEP and the words we heard Monday from Mr. Knight on where things stand with the State do not match. Only one can be speaking the truth. My comments to the commission had nothing to do with opposition to a new library. They addressed the city’s failure to comply with the grant, failure to advise decision makers about the existence of grant restrictions when choosing a site for the library, and failure to conduct city governance in an open and inclusive manner. If you have not read the original grant and the terms of the grant, you might wish to inform yourself on the particulars before you speak. If you have not reviewed copies of all correspondence between Mr. Knight and the State about the grant you might wish to do so before you judge who is doing what to whom. Always questioning the actions of the City Commission. I find life much easier now that I have become one of Leary’s Zombies. I don’t have to think anymore. We are a small group but hope to be a majority one day. 6) All elections in Winter Park are honest and the number of votes the government tells the residents each candidate got, that’s what they got. 7) Mayor Leary’s only source of income is his $3,000 a year salary as mayor and the money he gets from his business manufacturing devices used under water. Some Library promoters have gone to lengths of calculating how much per day the new library will cost them. Pitt Warner on The Voice Facebook page today says the new library will cost him 18 cents a day. Here’s why this argument doesn’t hold water. 1) They never say how much they stand to profit if the new library gets built. Real estate investments and business in the area, not to mention the businesses associated with bringing the project to completion, stand a good chance of being more valuable with the new library. So it’s entirely possible that for these same folks the library will be a net positive of 18 cent a day, $1.80 a day, $18 a day, $180 a day, or $1,800 a day. They might actually MAKE money from the new library being built. 2) They don’t factor in the costs of added fuel and car expense for added time spent in traffic as a result of the inconvenient location for most residents and the added traffic congestion anticipated. That 18 cents could double, or triple, or worse when car fare and lost time in traffic that could be used making money is figured in. 3) There’s no real way to check their numbers because THERE IS NO FINAL BUDGET. One resident’s analysis, using numbers provided by the City, noted a nearly $10 million budget gap. That could mean Leary and Co. will be back to the trough next year with another bond referendum, jacking up the cost per resident per day, perhaps exponentially. 5) Most residents think the existing library is fine and not worth the money to replace. Ah, um, maybe you need to re-read my post. 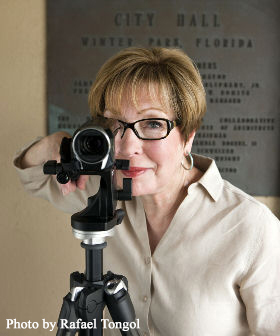 I listened to the commission meeting Monday evening and watched the videos of Commissioner Sprinkel and Mayor Leary. I heard repeatedly that “only a small group of people continue to be against the project.” Also, Commissioner Sprinkel states that this is “an issue that some people in this community have created for us.” The Mayor also states that he believes that this opposition is not genuine. I want to respectfully have you consider that it is not a small group that opposed the project. There were 2,500 people who signed a petition submitted to the City objecting to placing the library in MLK Park. This petition was rejected by Mayor Leary. More importantly there were 5,200 citizens who voted against the bond issue and project as presented by the electioneering materials sent by the City and Library. The vote for the project won with only a 200+ margin. In addition, many of the voters who supported the project can’t help be disappointed with how far the project has strayed from the original promises (I have all the electioneering materials sent to voters) – 50,000 square foot library, a parking structure, and minimal encroachment into the Park, a café, a welcome pavilion, LEED certification, etc. So I would be cautious in characterizing those who oppose the project as originally presented and the current scaled down project with surface parking spread out over the Park as a “small group” of naysayers. There is a lot more behind this small group than you have imagined. We are genuine in our opposition. In addition, you as the Mayor, Commission and City Manager have created this problem, not us. This issue will also have repercussions in the upcoming election and future elections in the City of Winter Park and beyond. MLK Park was designated to be a Rollins & minor league baseball stadium by some City Commissioners prior to a residents petition opposing it. The Library Task Force stacked with Rollins and real estate business people. Library Task Force said MLK Park is the best location. Denning Drive redevelopment creates bicycle path from MLK Park almost to Rollins main campus. City Commission engages and approves design from architect who’s design experience is mostly museums. Rollins has aspired to have it’s museum collection in an are where it would get more visitors. Rollins President says he wants a greater percentage of students living on campus. Rollins announces and City Commission approves building 500 apartments on Rollins main campus and an 850 space, 5 story parking garage on Fairbanks. Rolllins plans are said to expand Alfond Inn and redevelop another Rollins owned property down the street from it without giving many details. Winter Park City Commission delays building library and events center, and blames the delay on residents. 1) Plans to build the library/events center (a/k/a “the arts campus”) in MLK Park as designed have been scrapped by the movers and the shakers because Rollins has decided it wants its art museum on one of its properties in downtown Winter Park instead of at MLK Park. 2) If MLK Park will not be an arts satellite campus of the main college, that may mean there are or soon will be plans to redevelop it some other way. Since the new building design was all along for an art museum (and just a pretend library), that would likely be scrapped for a new design for whatever new purposes are intended for MLK Park. 3) City Commission’s favorite time for bond referendum is during a presidential primary election when the approval results won’t raise as much suspicion due to voter distraction with higher profile races. So 2020 could bring a new plan for MLK Park and more bond money for it. 4) If City Commission demolishes the Civic Center that will create a “need” for a new Civic Center, but at least one City Commissioner – Pete Weldon – has said he does not believe the City should be in the business of event facility landlord, but has gone along with everything due to voter approval. 5) For Rollins to bring even more students on campus, it would have to redevelop other existing dormitories and buildings on its campus. By expanding the definition of its “campus” to include MLK Park, and Alfond baseball stadium, it could build more apartments there subject to City Commission approval. 6) Since nobody complained about Rollins building plans for its 500 unit new apartment building on campus, it is likely that they will be back with other requests to build apartments in Winter Park. By calling them “dormitories”they avoid the kind of public opposition that apartments create. But these are apartments they are building each with private bath and not dormitories in the traditional sense. 7) The new Fairbanks 850 space parking garage brings more Rollins parking on campus and opens space in the existing Rollins garage for their art museum facility should they build one in downtown Winter Park.